Living Space: 3500 sq. ft. This is a beautiful home on a beautiful property! 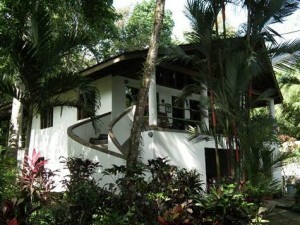 The property is located between Dominical and Uvita a few meters off of the paved coastal highway. From the minute you enter the gate you feel like you have stepped foot into a tropical paradise thanks to the large trees, mature gardens, and the 2 rivers that cut through the property! The main house is 2 bedrooms plus an office and has a great room comprised of the living room and kitchen that open up to the front porch with a great ocean view. The back porch has a covered dining area and looks down on the back river. Downstairs is covered parking for 2 cars, the second bedroom, laundry room, and a large workshop. The first cabina is next to the house and has the bedroom downstairs and the kitchen, living room and deck upstairs. It also has a 20 ft shipping container built into it! The second cabina is out back and is comprised of 2 seperate structures, bedroom in one and the kitchen and living room in the other. This one has a deck looking right down on the river. It is also on a seperate 1/2 acre of land that could be segregated and sold if someone wanted. The cabinas rent for $450 per month or $35 per night and stay booked quite often. There is plenty of room to add more cabinas if you wanted to produce more passive income! This property is definitly worth checking out if you want to live the easy life and collect some income on the side! !